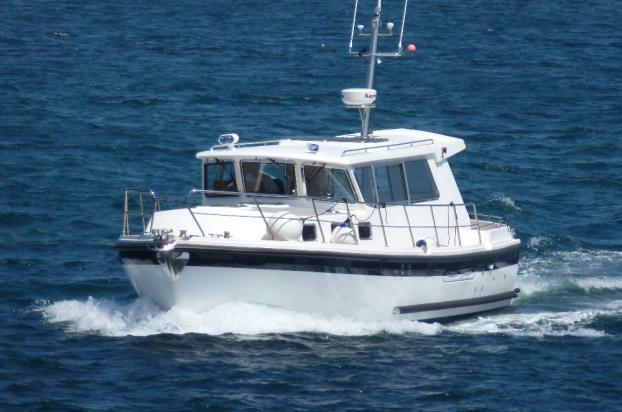 This an rare opportunity to purchase a stunning example of the Aquastar 38 aft cockpit. Constructed by Aquastar and professionally fitted out by Island Marine Craft, Cocos was launched in July 2013. Cocos is a perfect cruising boat for two people as the accommodation offers a large forward double king size cabin, ensite heads / shower room. The main wheelhouse / saloon is larger than most Aquastar 38's due to the forward raked windscreen. Cocos is now offered for sale as her owners wish to pursue other interests away from boating. Galley, Waeco stainless steel 80 litre fridge Smeg 2 ring induction hob Smeg stainless steel microwave / combination oven 1.5 stainless steel sink integrated into worktop Gohe mixer tap with pull out spray Corian worktop with integral draining board ￼Bin – general waste and separate recycling Lockers and drawers with pull out stainless steel baskets.